I miss the beach desperately. It’s taken a good while to realise it, if I’m honest. But these last few weeks, during my second inland summer in Australia, it has hit me with a vengeance. So, despite having made a commitment two weeks ago to get serious about writing, and despite having a stack of stories in my head just waiting to be transcribed, instead I’ve been driving two hours each way these last two weekends so I can breathe in the sea air, get sand between my toes and dive beneath the water. It’s helped me plan my future out a little more too. My next job has to be in a seaside location. No more inland living for me, it’s just not in my blood and I’m not remotely cut out for it. I guess being born and raised by the beautiful unspoilt beaches of Geraldton was bound to have some kind of effect like this. So I’ve been looking around for places that inspire me as possible future homes. Last weekend I was drawn to the western end of the Great Ocean Road – starting at Port Campbell, then checked out Peterborough and some of the isolated bays west of there, such as the Bay of Martyrs, before ending up at Warrnambool. Australia Day – can’t get much more aussie … ? I like Warrnambool – it feels a bit like my hometown of Geraldton, only bigger. The other morning I was amused to hear on the radio they were running the annual Undi 500 race down the main street of the town – in which the competitors have to race in their undies, and with the Mayor amongst them. The place obviously has a good sense of humour. Victorian friends have told me I ought to go there on a windy miserable stormy day, and then decide if I still want to live there! Maybe that’s why you need a sense of humour to live there. Last night I stayed in Geelong – having had trouble finding a caravan park by a beach where I could stay just for one night, I settled for one by the Barwon River in Geelong. It was a fabulous location, and after my dinner I enjoyed a beautiful walk along the wide attractive river, which has walking / cycling tracks along both banks and a rowing course at its heart through Barwon Valley Park. I could certainly imagine living near there and spending many enjoyable mornings and evenings running or cycling, as evidently many locals do. It was a busy place last night. This morning I arranged to meet a friend at Ocean Grove beach. When I arrived there was a thick sea fog, which eventually cleared to present a gorgeous hot sunny day. There was a Disabled Surfers Association event in progress at the beach, which was incredibly special to see. I hear time and time again that volunteerism is dead – that you can’t find people willing to get involved and give their time for a good cause these days, especially gen X and gen Y. This initiative proves that theory comprehensively wrong. With all the volunteers decked out in bright blue rashies, you can clearly see the impressive number of them on the beach. They all play a role in giving every person with a disability – whatever that disability may be – an opportunity to experience the joy of surfing. It’s just so inspiring to see. 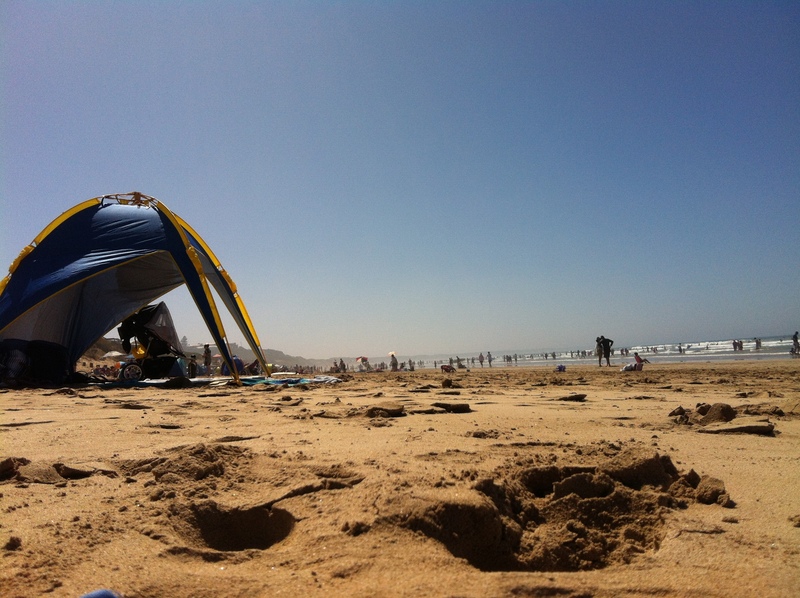 I liked Ocean Grove beach too – a long enough stretch of uninterrupted sandy beach front to feel something like the freedom of my more familiar Western Australian beaches, though the number of people crowded in here is pretty alien. I also thought it had just the right amount of development to make it accessible and with the kind of facilities you’d want (nice to get a good takeaway coffee to take down on to the beach with us) without being too over the top and compromising the natural beauty of the place. Probably my favourite beach discovery of the day is Point Lonsdale. Finally I found something to rival my favourite Perth beach of Cottesloe – with beachfront parking just perfect for Sweetie and I to spend a couple of hours, shade, parkland and a friendly accessible beach, plus some shops and cafes for interest. A bit genteel for some, and sometimes I love a place with more of a wild feel about it, but today it was just right for my lunch stop. Later I discovered the less busy beaches either side of the lighthouse and wished I hadn’t spent quite so much time at the overpopulated front beach! But they’ll keep – I’ll be back that’s for sure. The back beach – spectacular! 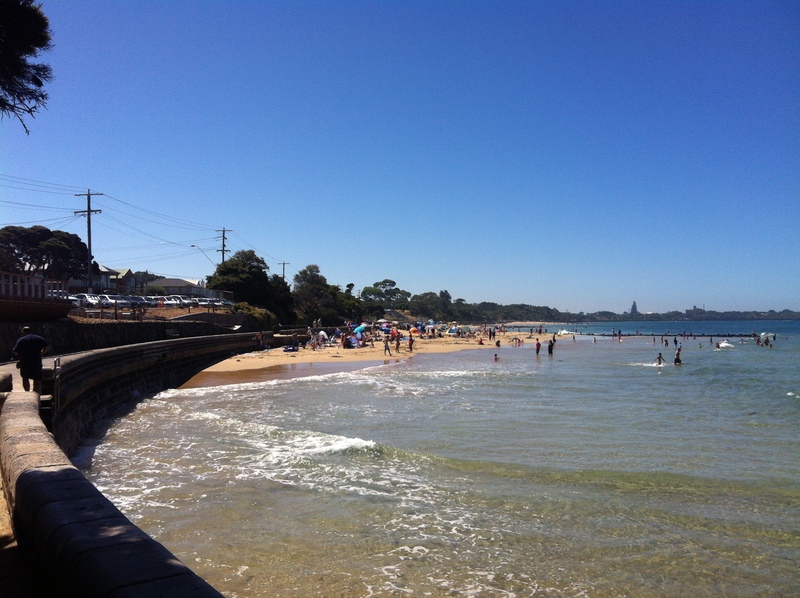 This entry was posted in Uncategorized and tagged Barwon Heads, Bay of Martyrs, beach, Bellarine Peninsula, Disabled Surfing Association, Geelong, Great Ocean Road, Ocean Grove, Point Lonsdale, Port Campbell, Warrnambool. Bookmark the permalink.